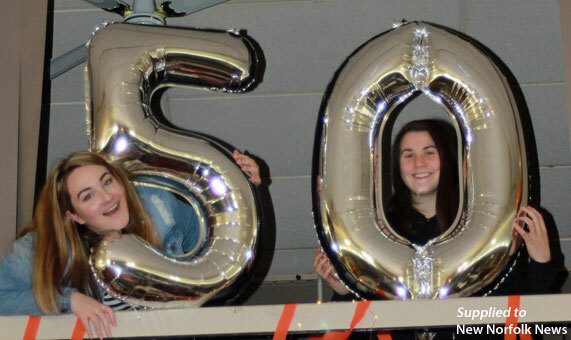 Younger members of the team celebrating the club's 50th birthday. MORE than 70 people met at the football clubrooms to join in the celebrations for the 50th anniversary of the New Norfolk Old Scholars Hockey Club recently. The club was honoured to host the event and see the reunion of so many past players and supporters. 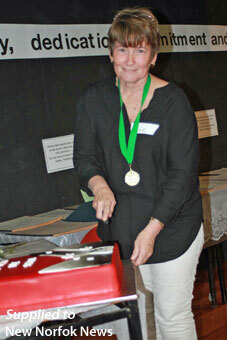 Five women from the founding team and club were in attendance and enjoyed mixing and reminiscing with the current team. Club stalwart Brian Eccles was unable to attend due to ill health but sent his congratulations and a few memories via club patron Carol Collins. A moment was taken during the evening to remember those players and supporters who have passed away. A legend of the men’s team, Larry Hills, provided an entertaining rendition of the team songs, The Tynwald Terriers and The Tynwald Tarts. Those present also enjoyed looking through the wealth of memorabilia that had, in the main, been kept and recorded by Brian and the late Marion Eccles. The club is privileged to have had such a comprehensive account of its history. During the evening it was announced that Lee Smith was about to make club history by being the first player to reach the grand milestone of 700 games in the final roster game of the 2017 season. Lee has been an inspirational leader and player for nearly 40 years. Her enthusiasm and commitment has been immeasurable. Lee has taken on numerous roles throughout the club including coaching and serving as president. A special highlight of Lee’s hockey career has been that she has played half of that time with her daughter, Sally. Finishing her final season with the best and fairest award for 2017 capped off Lee’s wonderful career prior to her retirement. Although the club’s future is in limbo at present, there were positive signs that the evening had sparked some interest from past players to rejoin for the 2018 season. As a result of the organisational effort given by Amy and Helen Bannister, everyone had a fantastic night with lots of hugs and laughter. Five original members, left, with the current team.